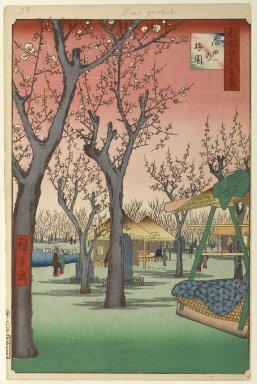 View of the extensive Plum Garden in the Kamata area. The estate which was open to the public complete with teahouses and a restaurant dated from the early Bunsei Period (1818-1830) and came to be known as the "Plum Mansion" (Umeyashiki), with its several hundred trees extending into the distance. The owner of the mansion was a medicine dealer from Omori, whose chief product was a cold remedy called Wachusan. The structure on the right is an indigo cushioned palanquin of the simple A-frame type known as a "yamakago" ("mountain palanquin") and was used widely for travel in Japan, suggesting that a traveler had stopped off from nearby Tokaido for a rest, leaving an over garment on top.